La Tour des Faucons Location. 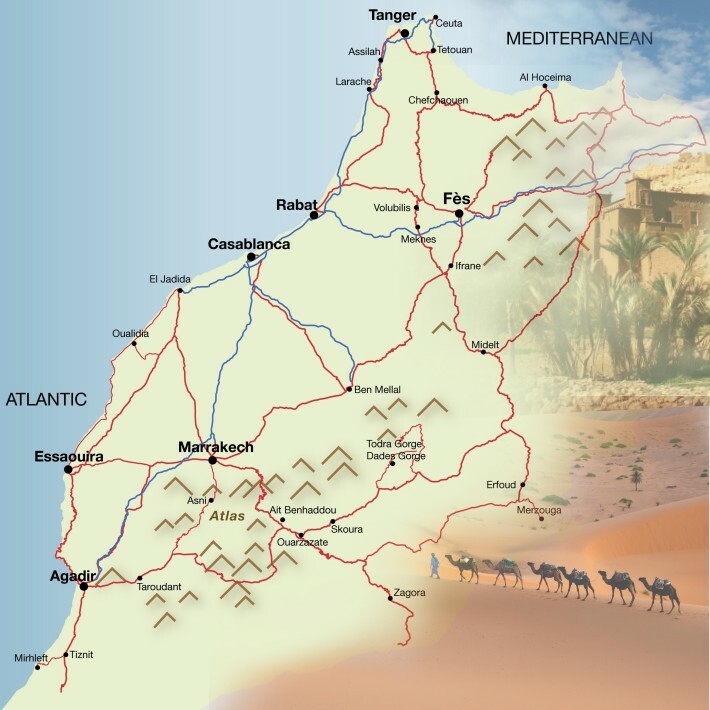 Book La Tour des Faucons Today with Hip Morocco - Holiday Accommodation in Agadir & Taroudant, Morocco. 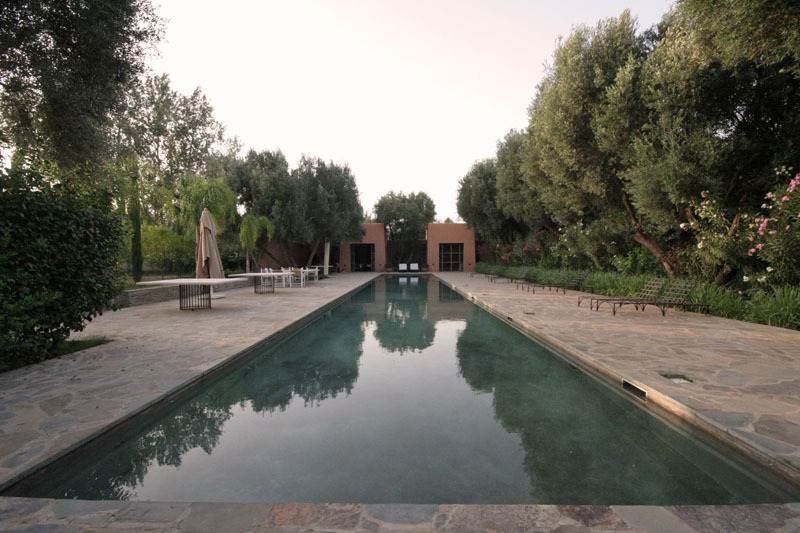 "An idyllic retreat in the surrounding Taroudant countryside"
Out of a serene dreamlike novel comes the stunning property of La Tour des Faucons: a renovated Berber farmhouse set among endless pastures of uniform palms and sporadic olive groves. 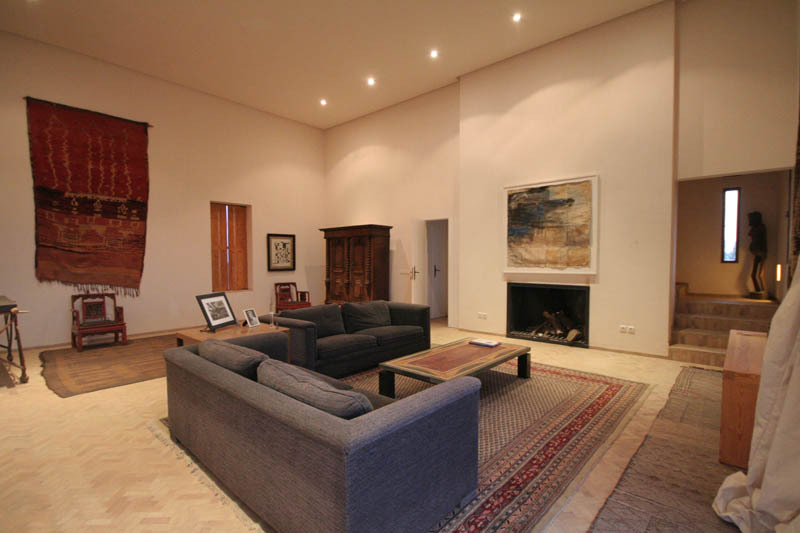 Renovated over a period of 10 years by the warm and welcoming owner Karl, La Tour des Faucons possesses 7 bedrooms 3 of which form the original farmhouse and 4 have been part of the contemporary villa and tower extension. Rooms in the farmhouse have retained their cosy dark sensual charm, with intimate spaces but all beautifully crafted and kept. 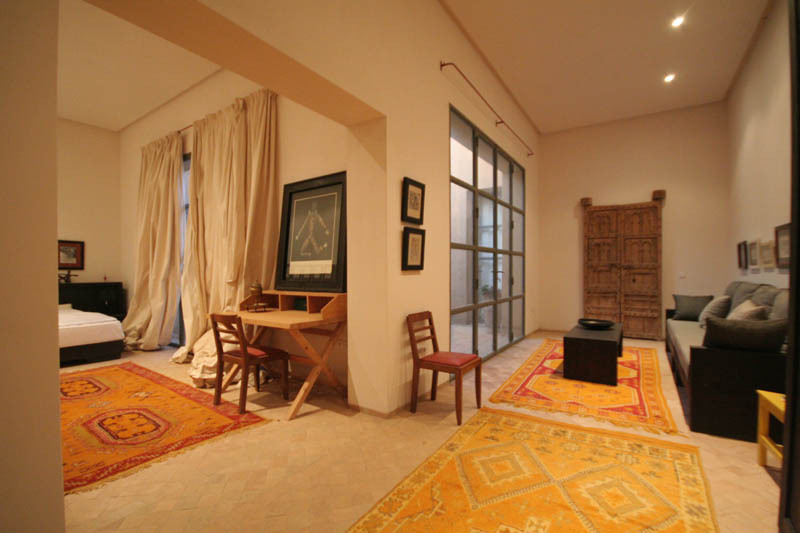 The new house villa and tower offer rooms and communal spaces in the style of a contemporary London art loft, with high ceilings, squared rooms and collection of beautiful furnishings both antique and modern contemporary. 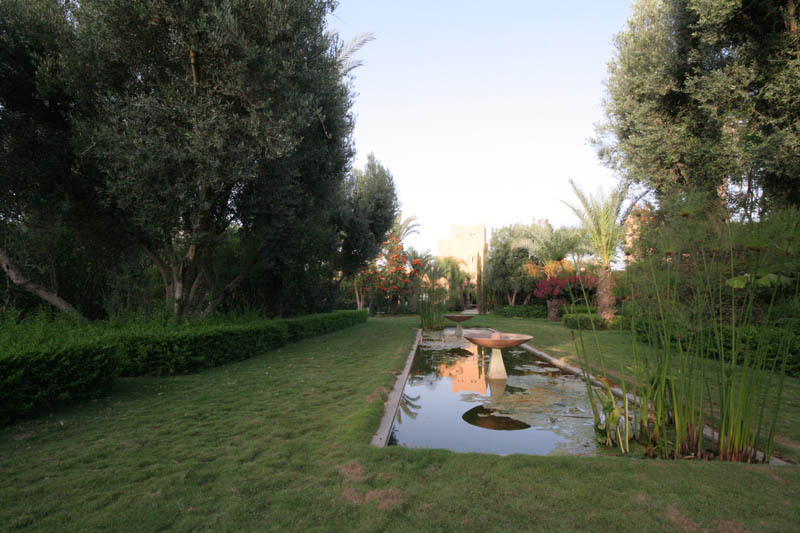 The grounds of La Tour des Faucons are a general progression of marvelous colorful plants, bushes and fruit giving trees providing delectable fresh olives and domestic olive oil, set alongside a 33 metre swimming pool leading to the charming pool house: perfect for relaxing afternoon lunches on a group holiday in Taroudant or more intimate romantic stay in Morocco. 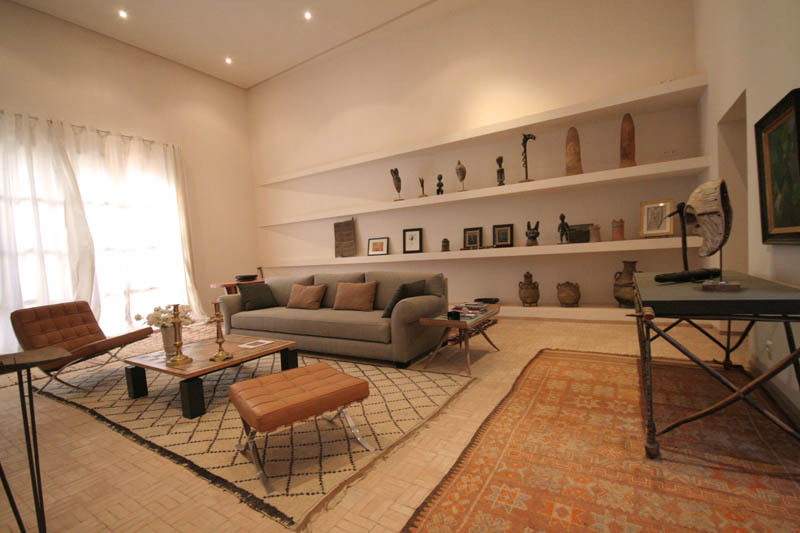 The owner possesses a impressive collection of original Berber antiques, art pieces and more contemporary paintings that populate the spaces throughout La Tour des Faucons. 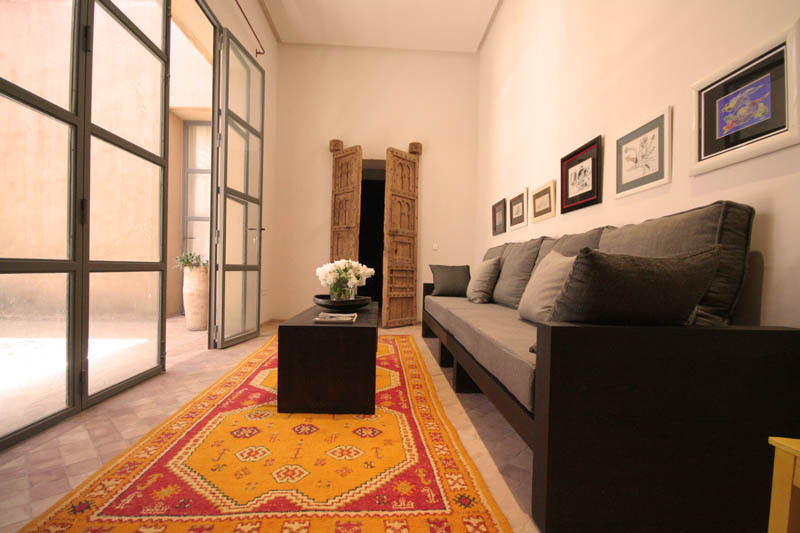 Comparable to a British museum collection of Moroccan pieces consisting of beautifully ornate hand carved Moroccan wooden doors and small enigmatic sculptures of the human form, Le Tour des Faucons is a truly a unique Riad in Taroudant and a delightful addition to any stay in Morocco. The wonderfully welcoming and generous owner Karl along with his staff are on hand to provide an array of exquisite dishes to your choice. Traditional Moroccan or creative contemporary Mediterranean dishes, dining in house at La Tour des Faucons is a relaxed and personalised experience. Offering magnificent creative Moroccan dishes, Dar Zitoune is a must visit restaurant in Morocco for a taste of genuine Moroccan food. 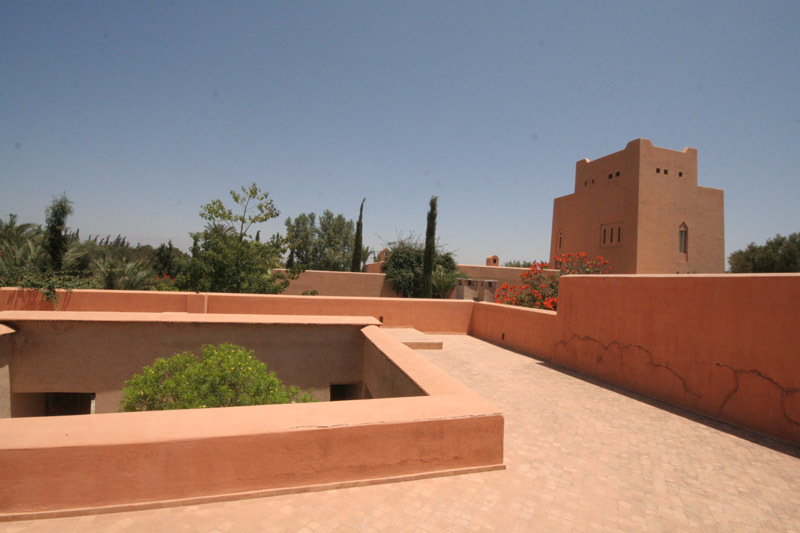 Located outside of Taroudant 10 minutes drive from La Tour des Faucons, Dar Zitoune is on of the best restaurants in Taroudant. 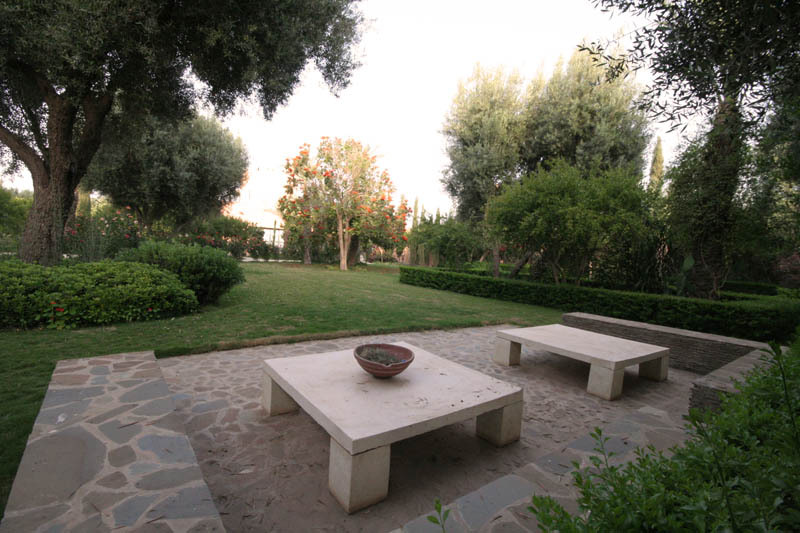 Located 2 miles from the centre of Taroudant, La Tour des Faucons is situated in the quiet Berber countryside surrounding Taroudant, among rows of palm groves and acres of undulating olive trees. 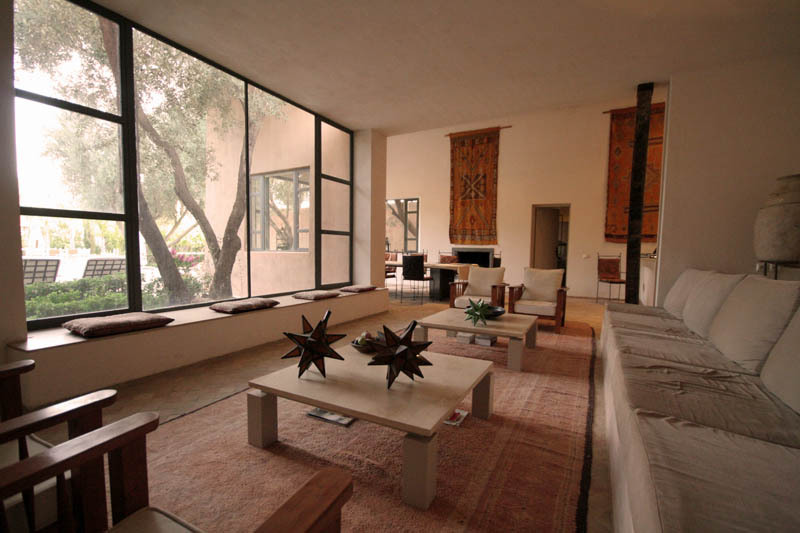 Located on the ground floor of La Tour des Faucons, this suite opens out through the large French windows onto the courtyard dotted with deep green leaved orange trees and spacious courtyard seating areas. The spacious bedroom has a large double bed at one end with salon area at the other consisting of giant sofa and comfy armchairs. 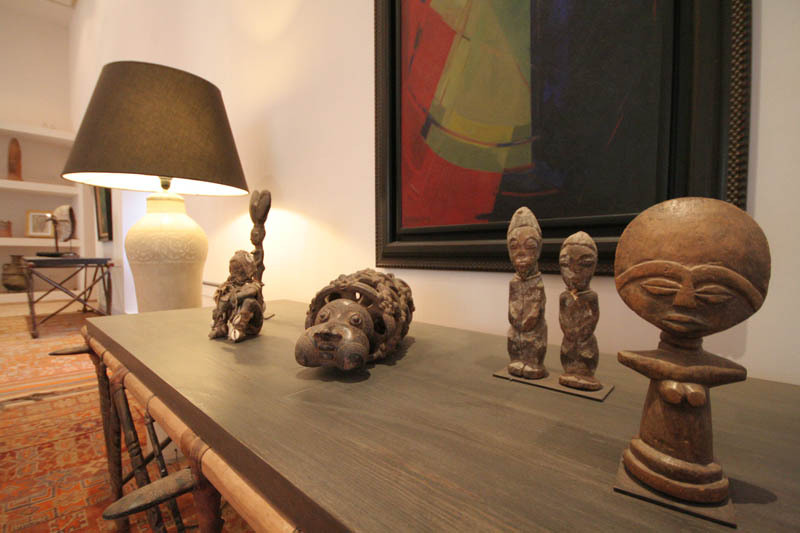 The bedroom is furnished with a divers collection of Berber and European art pieces creatively put together to create a charming fresh atmosphere. 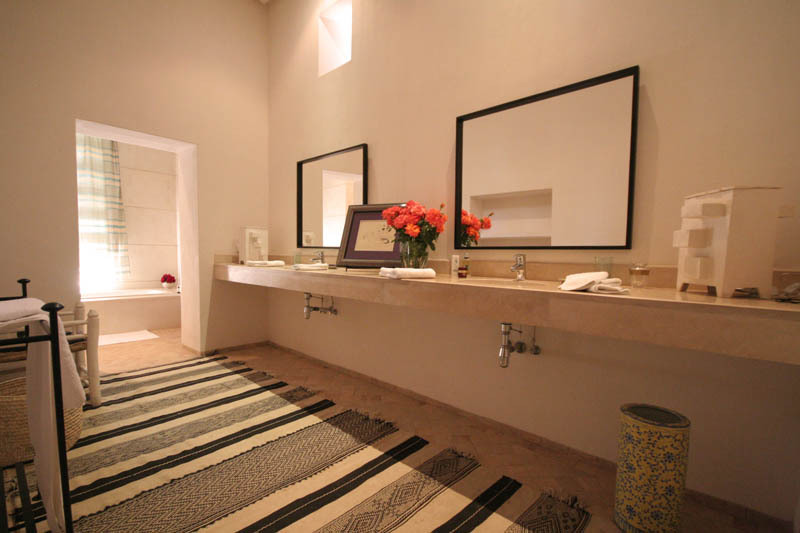 The bathroom is accessed through a swinging thick antique Moroccan door, with fresh contemporary tiled floors and long countertop and mirrors. The bathroom has an enclosed tub with views out onto the gardens of La Tour des Faucons. 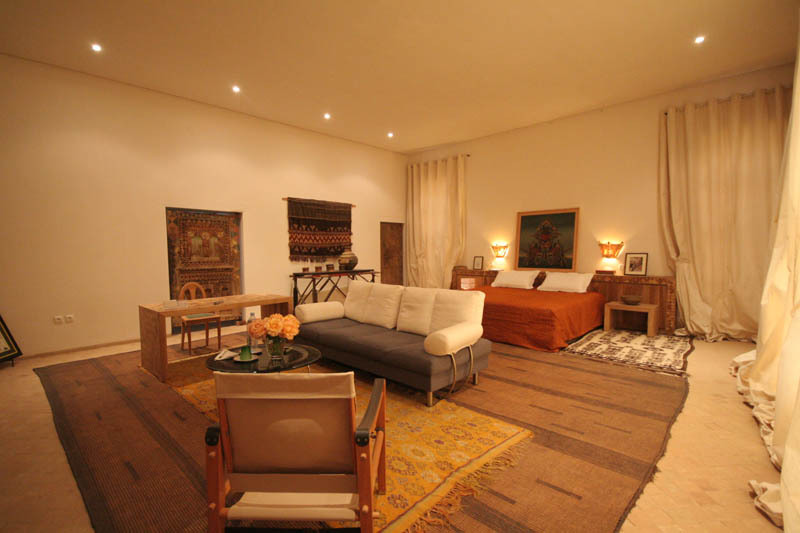 A beautiful suite on a romantic getaway in Morocco for guests preferring easier access. 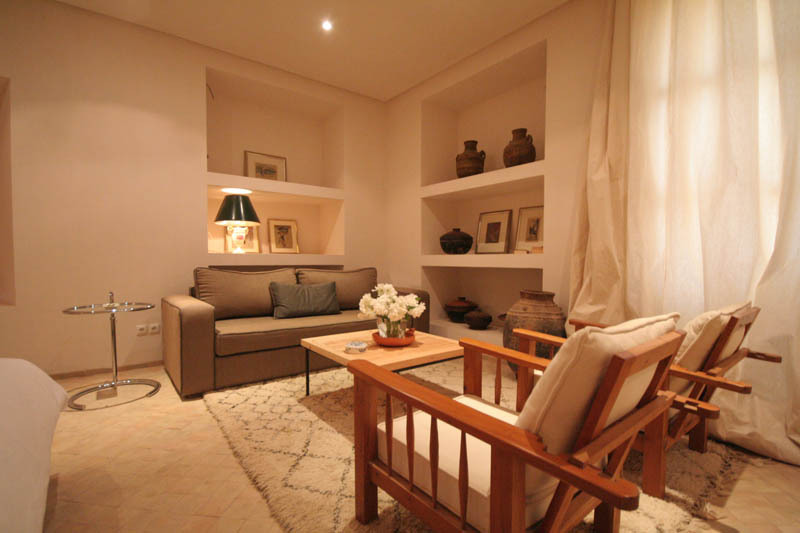 This room can be easily accessed to the Villa suite 2 upon request. 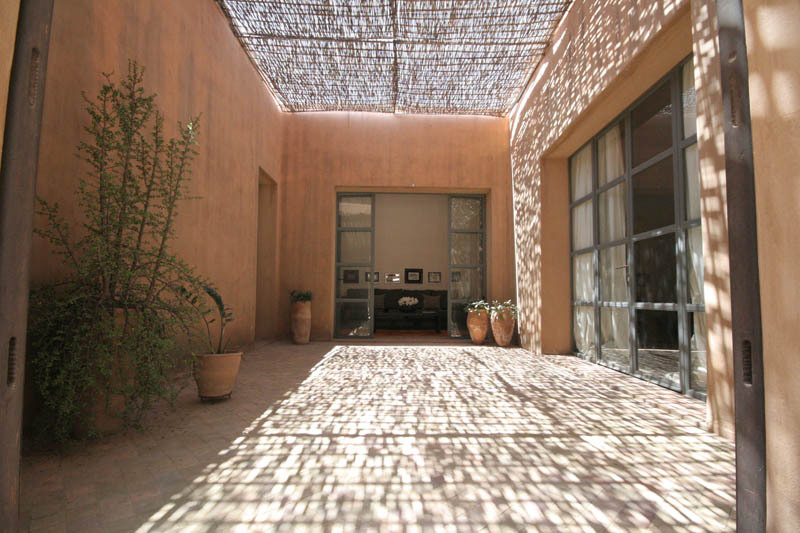 This spacious suite on the ground floor of La Tour des Faucons has its own private enclosed courtyard, topped with a bamboo ceiling allowing a cooling amount of sunlight to bath the surrounding rooms of this suite. 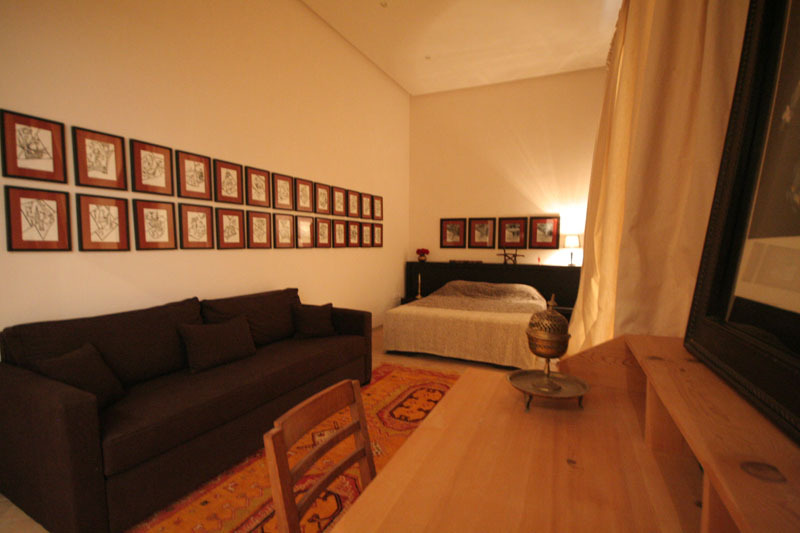 The bedroom has a double bed and work desk, with collection of contemporary wall art. The tall French windows with long cream curtains open onto the courtyard giving plenty of natural light. 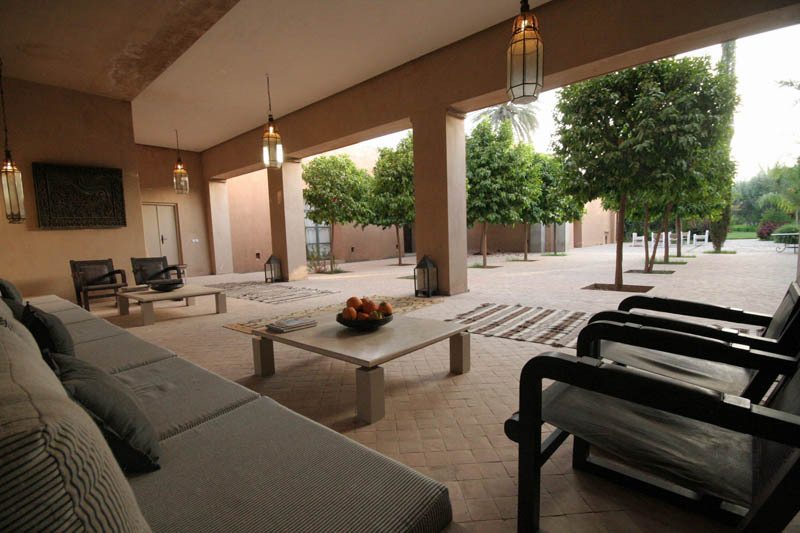 A private salon with long sofa bench and table sit round the corner from the bedroom, looking onto the private courtyard and orange tree filled patio beyond. 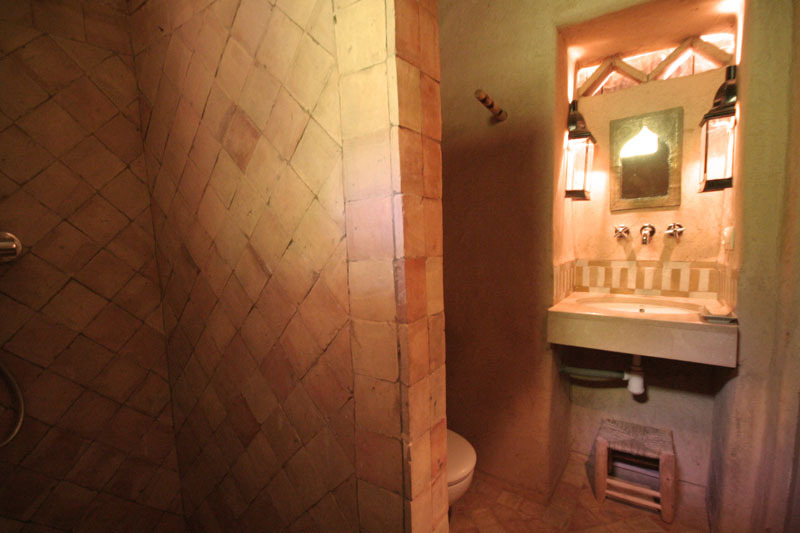 The ensuite bathroom is located in the original farmhouse of La Tour des Faucons, with clay and straw lined walls and a shower. This room can be easily accessed to the Villa suite 1 upon request. This suite at La Tour des Faucons is designed with a tall art studio styled ceiling with fresh white washed walls and warm wooden furnishings. The large double bed sits alongside the spacious salon seating area, with dark grey sofa, comfy armchairs and antique Berber pots and cookware. 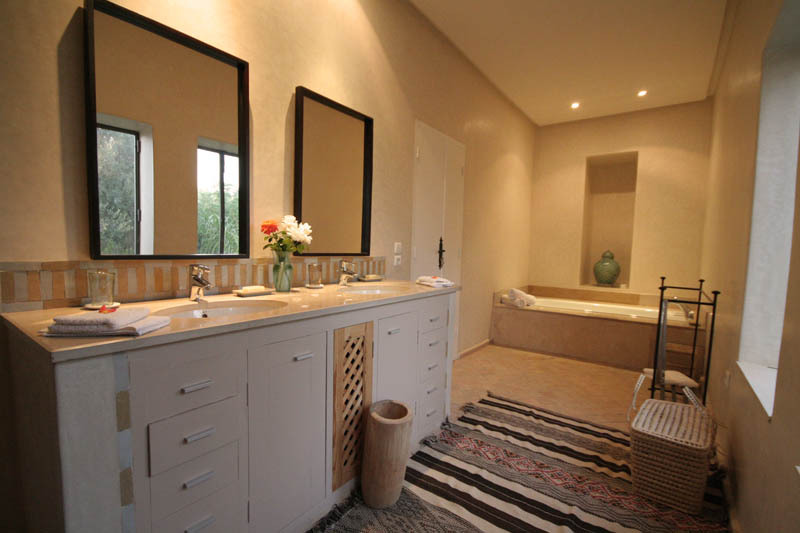 The long inviting bathroom has double wash basins and stone enclosed bathtub with exterior facing windows looking onto the gardens of La Tour des Faucons. 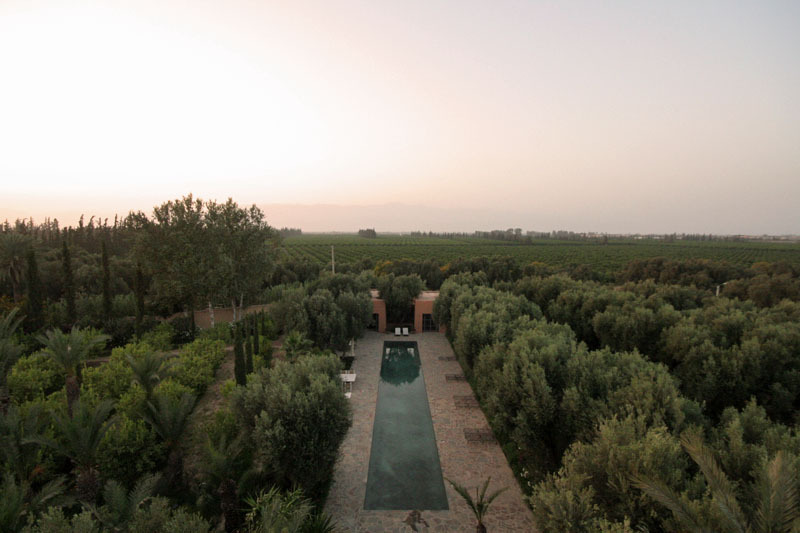 The Tower suite 3 has a private terrace looking down on the pool house and across the eye level canopies of the acres of neighbouring olive trees. The largest of all the suites at La Tour des Faucons, this suite is situated at the top of the newly refurbished tower on two levels. 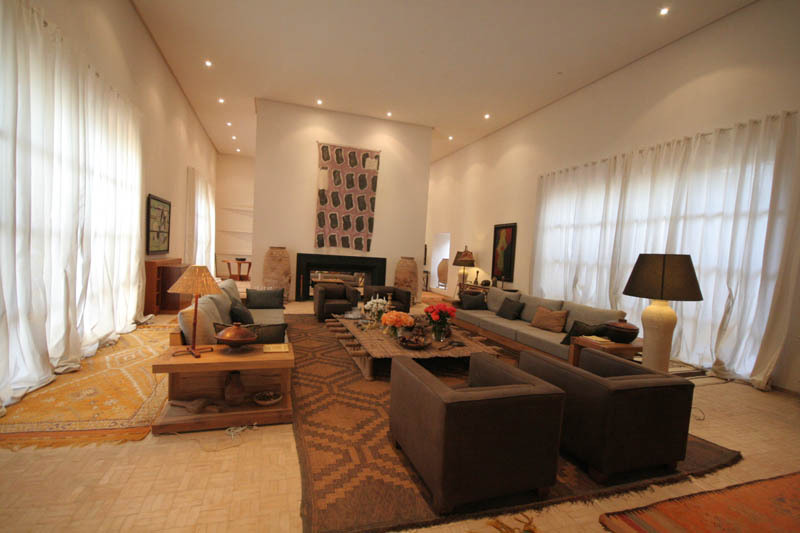 The large lounge area has L shaped sofas facing a grand fireplace, and set alongside a collection of beautiful antique Berber furniture and small stone sculpted art pieces. The lounge has a private covered balcony looking out over the grounds and pool. 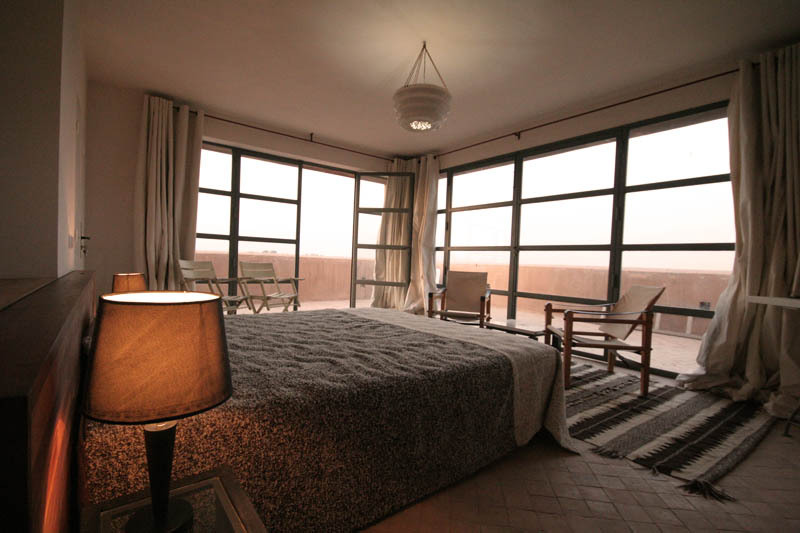 The bedroom is situated on the upper level, with large double bed and giant French windows on 2 of the walls opening out onto the spacious uncovered balcony with sunloungers and one of the best views in Taroudant of surrounding farmland and towering mountains of the High atlas way above the horizon. 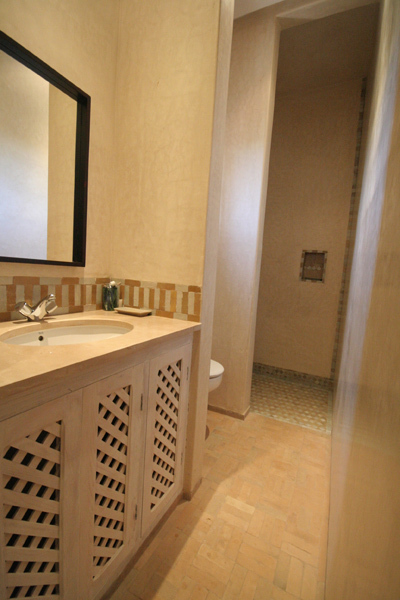 The cosy bathroom has a shower and decorated in earth colored Moroccan tiling. 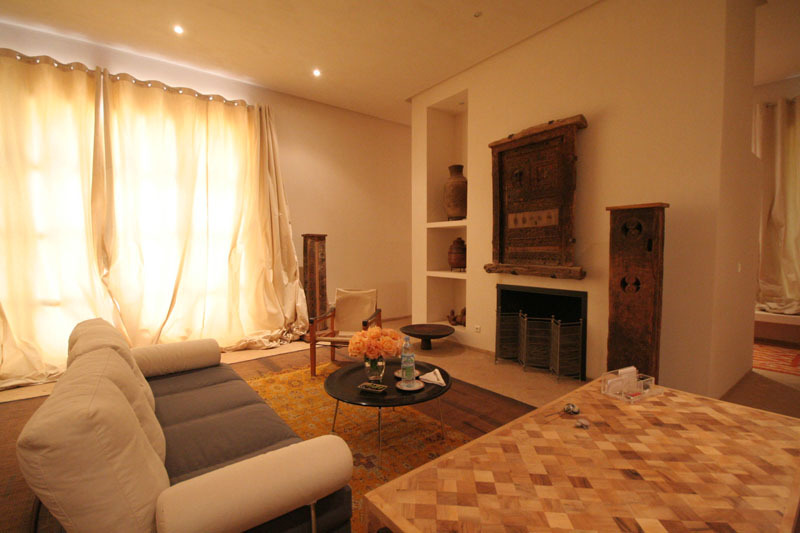 This suite is perfect for a honeymoon in Morocco or relaxing and inspiring artist retreat. 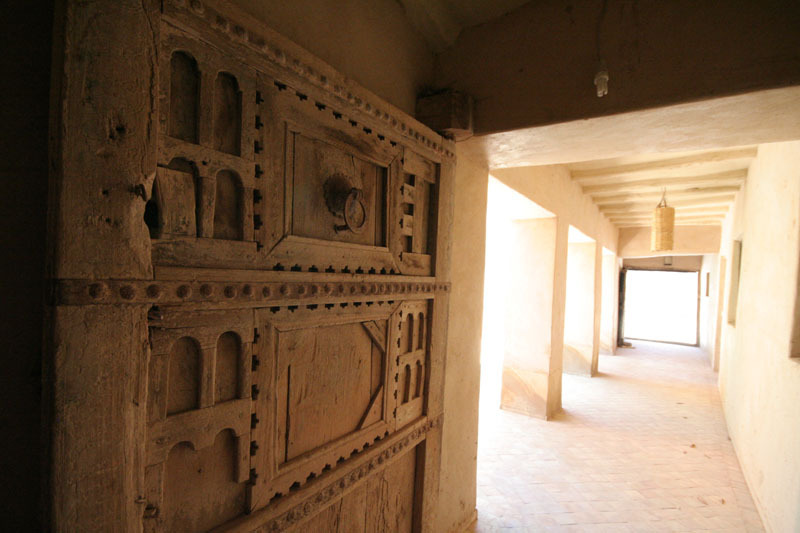 The original farmhouse has been kept for the most part as this, with clay, straw walls as is the traditional Berber village building style, keeping rooms cool when needed. 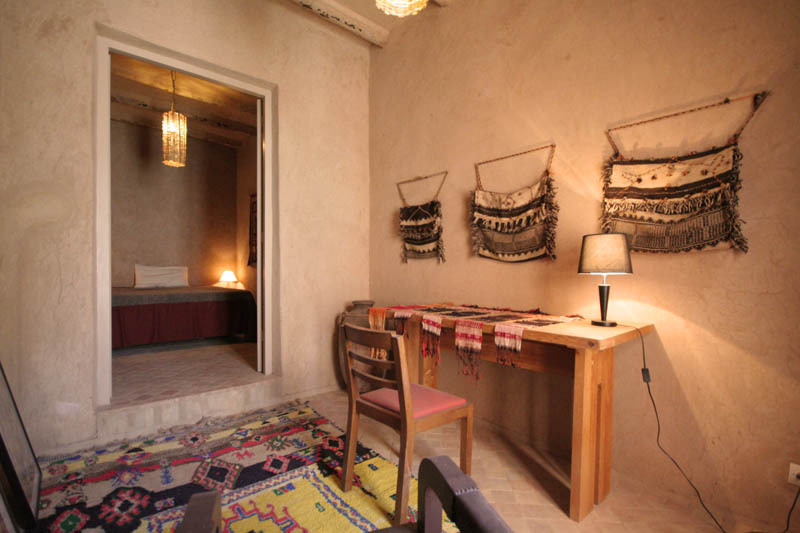 The Farmhouse room 5 has a double bed and separate office room with desk and Berber textile wall art. The salon area has a deep sensual red sofa and table, perfectly suited to this intimate room at La Tour des Faucons. 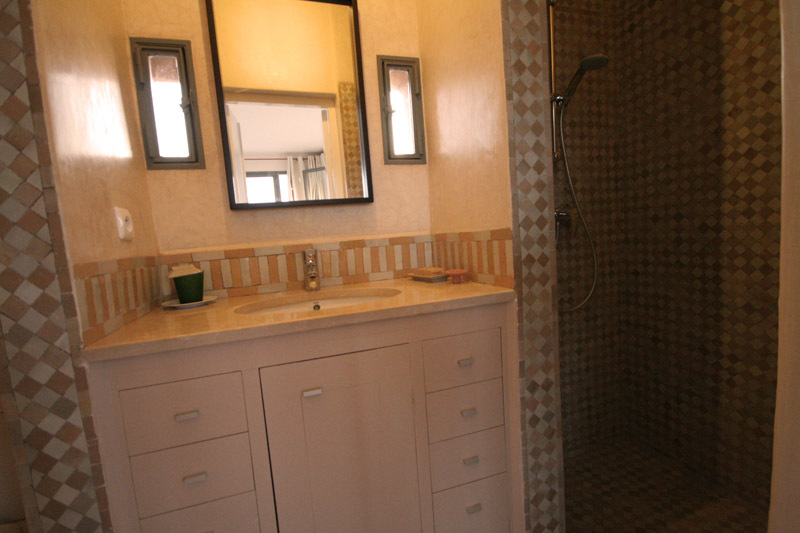 The bathroom has a large walk in shower and Moroccan styled basin for one. 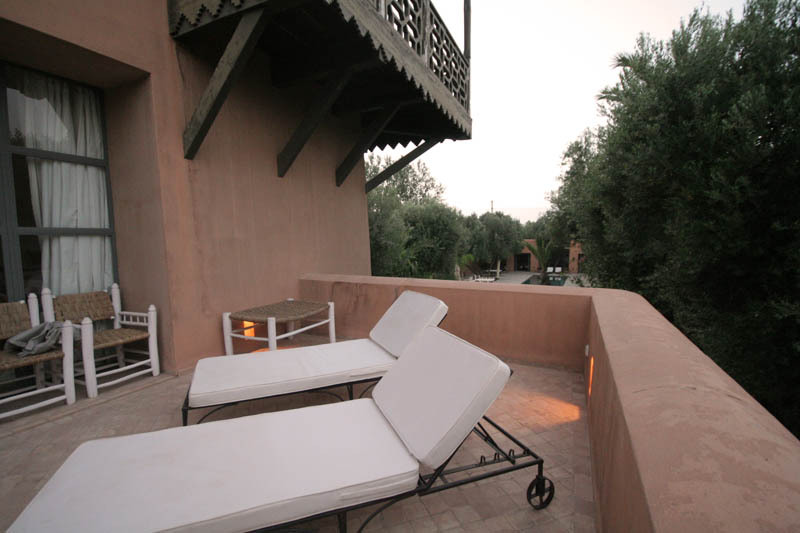 Well suited for guests wanting a more authentic experience of Morocco on their stay in Taroudant. 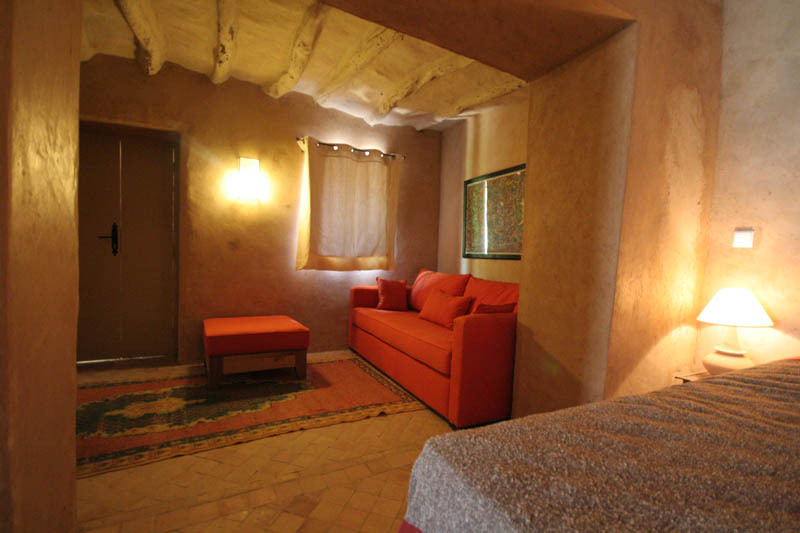 This room is located on the ground floor of La Tour des Faucons, and is constructed in a long thin Berber countryside style. 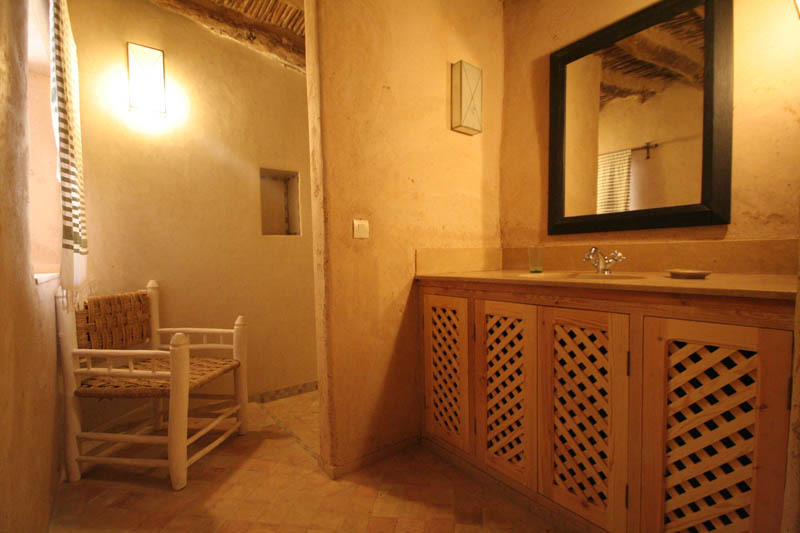 Walls are crafted charmingly out of clay and straw for a more authentic stay in Taroudant. 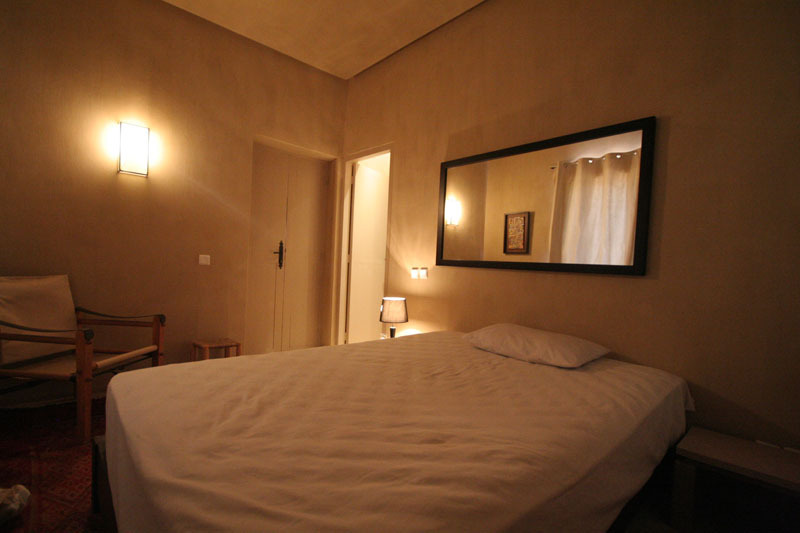 The cosy, intimate bedroom has a double bed and separated form the private salon by a arched doorway. The salon has a along bench sofa which look out onto the central floral courtyard filled with small trees and colorful bushes. 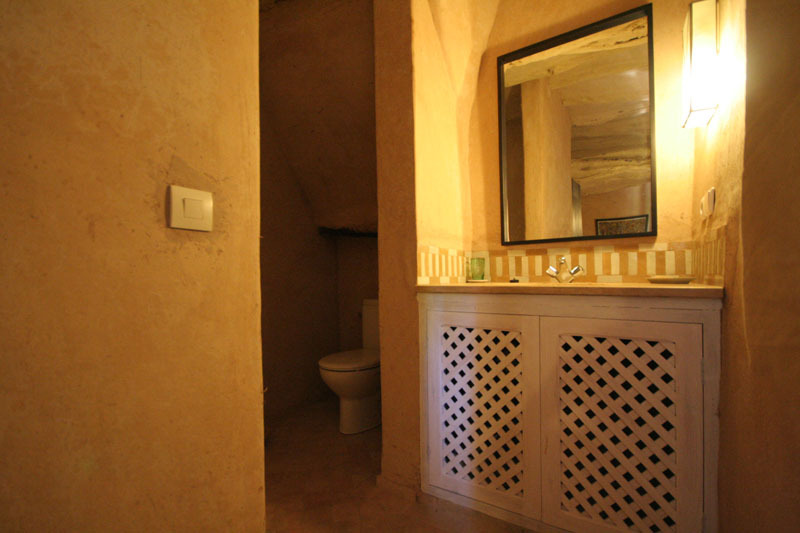 The dark sensual bathroom has a Moroccan styled washbasin and walk in shower, perfect for 2 on a quiet honeymoon in Morocco. 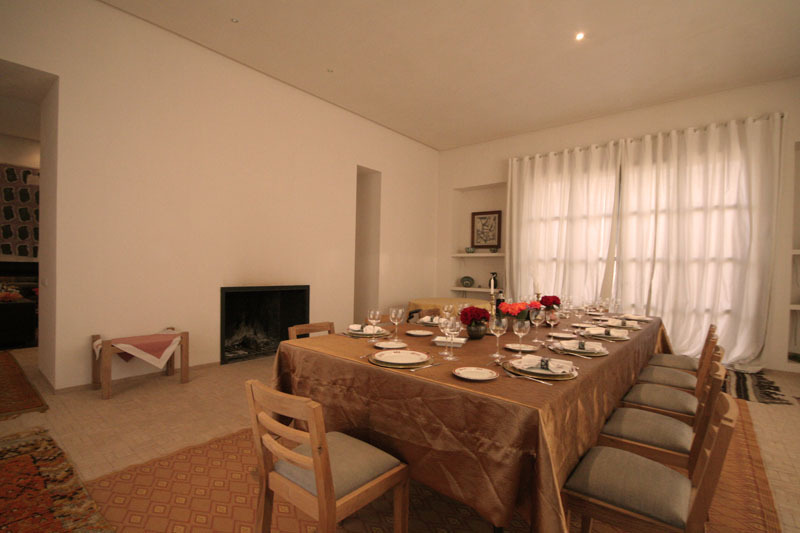 This room is located on the upper level of the 1st floor farmhouse at La Tour des Faucons. 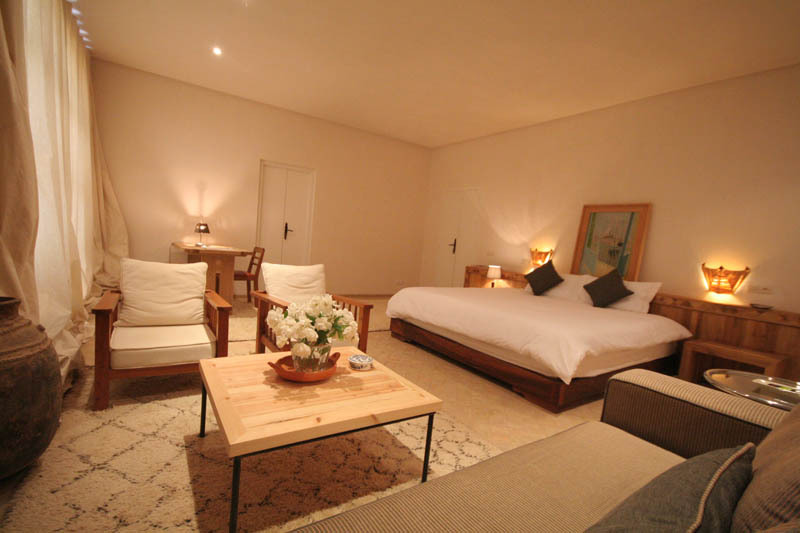 This cosy double room offers high views over the Moroccan countryside and gardens of La Tour des Faucons. 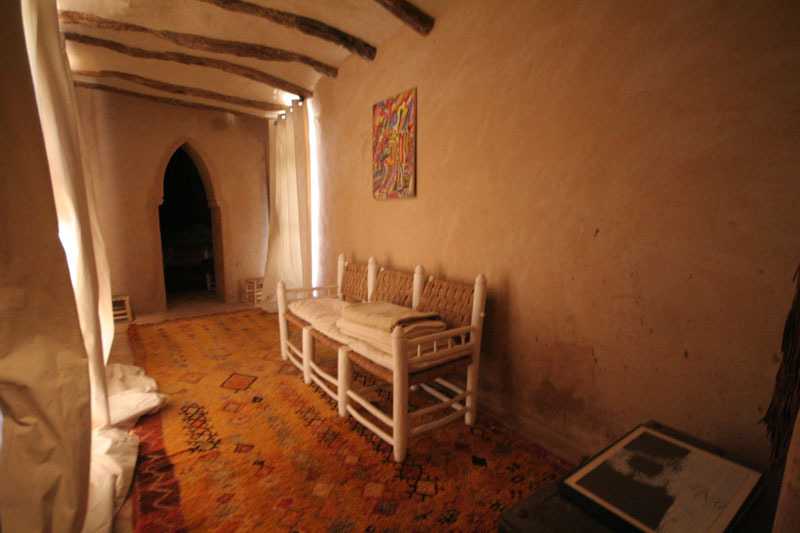 The double bed sits among a collection of Berber wall art and floor rugs. The base rate price at La Tour des Faucons is in pounds, euros, or Moroccan dirhams and exchange rates are approximate.